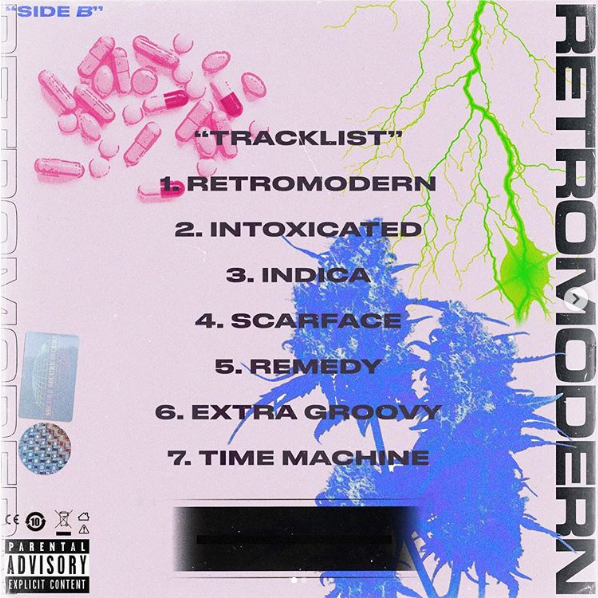 Today on Sensei’s Music Blog, we get to help hip hop artist INDICA drop his anticipated “RETROMODERN” EP - which is all together, a dynamic take on production and style of current, new wave hip hop. The 7 track EP is one of our favorites of the year, simply because it really does touch on many differing vibes to provide you with a well rounded song-list for any situation or mood. Created in collaboration with producer Andrew Luce, “RETROMODERN” sees INDICA blending some nostalgic textures and soundscapes with his own swaggy flow. Throughout the EP, INDICA keeps listeners engaged from track to track with his sun-kissed California vibe oozing out of every line. With tempo and instrumental changes from track to track, the project brings an array of grooves while also feeling totally composed and cohesive. With INDICA's smooth, auto-tuned vocals and impeccable melodies leading the way, every track is promised to invade your head and set up camp. Earworm hooks and top notch production stay consistent throughout the project, helping to set INDICA up for a big 2019. Lastly, if you’re diggin’ what INDICA is up to - make sure you throw him a follow on his social media links and stay up to date with his work as it drops. We actually did interview with INDICA himself and got a chance to know a little bit more about him and his work, so make sure you check it out! You’ll find everything you need alongside the interview and the whole “RETROMODERN” EP down below! Enjoy! Can you tell us a little bit about who you are and where you grew up? BASED IN LA - GREW UP ON THE EAST COAST, D.C. AREA. I PLAYED FOOTBALL AND BASKETBALL GROWING UP I WAS AN ATHLETE. What made you want to start making music? IʼVE ALWAYS WRITTEN RAPS SINCE I WAS IN ELEMENTARY SCHOOL AND WHEN I GOT INTO HIGH SCHOOL (FRESHMAN YEAR) I BOUGHT A MIC AND STARTED TO LEARN HOW TO RECORD MYSELF. Looking at your past releases; Tracks like ‘I Want Uʼ, ‘All The Drugsʼ and ‘She So Crazyʼ are all from over 3 years ago, what do you think has changed musically for you since then? THOSE SONGS WERE LIKE MY FIRST EVER TRACKS AND I FEEL LIKE THE RAWNESS I HAD CAME OFF IN THESE TRACKS - NOW IM MORE PRECISE WITH MY VOCALS AND BEAT SELECTION - SO JUST THE EVERYTHING HAS GROWN. Youʼre release of “Retromodern” marks a big step up in your sound over the years, whatʼs your favorite track(s) off the EP that you feel resonate with you or your listeners? I WANTED TO GIVE AN 80ʼs FEELING FOR SURE AND MY FAVORITE IS “INDICA” PERSONALLY AND ALL THE TRACKS CAN RESONATE DEPENDING YOUR MOOD. What artists, dead or alive, would be your dream collaboration? Youʼve seen a good amount of success in the music industry since your start, what would be some advice or a maybe few tips for someone looking rise through the ranks? JUST TO HAVE A THEME OR AN AESTHETIC THAT PEOPLE CAN BE ATTRACTED TO AND RELEASE CONTENT CONSISTENTLY. Last one! What would you like to say to your fans and your new listeners? Any upcoming shows that we can catch you live at? INTOXICATED VIDEO COMING NEXT AND MORE SINGLES THIS YEAR.